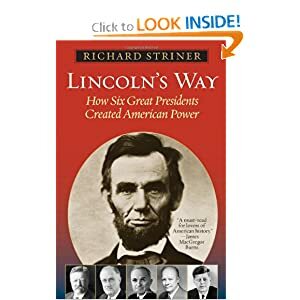 Richard Striner, a history professor at Washington College, is the author of Lincoln’s Way: How Six Great Presidents Created American Power. The Tea Party movement—our latest anti-government fad—uses imagery and slogans derived from our own revolution. But the party goers’ knowledge of history is slight, and their government-bashing oversimplifies America’s past. The problem is simple: the libertarian zeal that energized people like Samuel Adams and Patrick Henry brought disaster to the young nation. So other founders took action. Our first constitution (1781), the Articles of Confederation, was weak, and it was hard to get anything done. Accordingly, founders such as George Washington, Alexander Hamilton, and James Madison came to a decision: the Articles had to be scrapped. And many people supported this decision. Washington presided at the Constitutional Convention, but he doubted that the product was good enough. “The warmest friends” of the Constitution, he wrote to his nephew in November 1787, “do not contend that it is free from imperfections,” and “if evil is likely to arise there from, the remedy must come hereafter.” In his presidential years, he construed the Constitution broadly to support new initiatives, like a national bank, that he regarded as essential for the nation’s development. In 1794, when Pennsylvania farmers refused to pay a tax on whiskey to help finance his federal program, he suppressed the Whiskey Rebellion. Do the Tea Party sponsors know that? Other presidents have agreed with Washington that some “big government” is needed: Abraham Lincoln, Theodore Roosevelt and Dwight D. Eisenhower (all of them Republicans). Our liberty without a strong foundation is a “temporary truce with chaos,” said Eisenhower. Our global power is in danger from the Tea Party crew. The libertarian fanaticism that afflicts our political culture now and then—from people down the years as diverse as the John Birchers and the New Left to Tim McVeigh and the militias of the 1990s—is an ideological virus. If successful this November, it could cripple our efforts to recover the mastery that brought the United States superpower status in the years after World War II. There is nothing pre-ordained or guaranteed about superpower status. We could lose it. If our power should decline, rest assured that our enemies will know it. Our military power cannot subsist for long without proper civilian foundations: good infrastructure, strong productive capacity, abundant purchasing power, full employment. The Tea Party zealots believe that we are doomed if we spend too much. The reverse is true: we are doomed if these people steer us wrong. I didn’t mention foreign relations and national defense. You’ll find that there is a wide range of thought on the right and in libertarian circles on foreign policy and defense issues as well. You not only need to find out where various Tea Party members stand on such issues, including the size of the defense budget, you then have to discern whether the position stems from classic libertarian thinking or from something else. Recent polls show that over 70% of the U.S. public believes the Iraq War was not worth it. And that segments of the population have become more isolationist and wary of actions abroad. That obviously includes more than just liberals and Democrats, given party identification numbers. http://www.washingtonpost.com/wp-dyn/content/article/2010/10/15/AR2010101506018.html?referrer=emailarticle . The comments and demeanor expressed therein once seemed very ordinary and would not have attracted much attention. Nowadays, they seem startlingly bold, even brave, when considered against the backdrop of the churning Fox and Limbaugh fear factories. What historians will have to do in the future is to follow the different threads of ideology and personal characteristics and to see how they fit in to the larger fabric. Again, I suggest this requires considerable discernment, as just talking to ordinary people I know across the spectrum suggests it’s much more complex than your essay would have one believe. I'm sorry, Bill, but your died-hard (not even die-hard) stubbornness on this issue makes me fell quite uncomfortable towards acknowledging any development in your "sense of ridiculous". "Amicus Plato sed magis amica veritas." If the Tea Party largely leaned libertarian, one would expect to see a lot of outcry among its members about measures such as one attempted in Oklahoma in 2008. I’m thinking of the legislation which would have required the state to publish information about the age, marital status, race, years of education, state of residence, total number of pregnancies, live births, miscarriages and induced abortions about women undergoing abortions – without a single piece of information (age, marital status, number of women impregnated, number of children fathered, number of abortions lobbied for or consented to by the women the men impregnated) to be published about the men who impregnated them. Public nformation which, in small communities, could lead readers to identify the woman in question. Wherever one stands on abortion (I decline to state my own position), it is the seeming misogyny and unwordliness of such measures that has caught the attention of many of the younger women I know. A few younger women I know laughed and joked, “don’t those dudes in the legislature know what gets unzipped and how, for women to become pregnant?” On that, they may have a point, indeed. Even conservative columnist Kathleen Parker has written about the grumpy, patriarchal image of the right in the U.S. But not being a liberal doesn’t mean one projects misogyny. As someone who identified as a conservative in my youth, I would caution against stereotyping. I also have to question some of your rhetoric and your decision not to engage with posters here. It may simply be the characteristic of the right-self identifying commentariat I’ve seen around the web over the last few years, but many of them give off the same vibe as Fox News’ most famous female commentator. Andrew Sullivan, who sometimes writes admiringly of British conservatism yet cuttingly of ours, has given a lot of thought to the defining characteristics of Palinism. He points to Esther figures who believe they are special and chosen to save people from pending doom, in part at the hands of an “elite” and threatening “they.” Sully may be on to something as an explanation of why fear mongering and dividing citizens against their fellows has become such a hallmark of outlets of FNC. By contrast, earlier generations projected a can-do attitude and even stoicism in the face of challenges. They could rally together in the face of crises and catastrophes in ways hard to imagine happening in our “me, my and mine, no need for anyone to put country first” era. No looming Armageddon, no sense of specialness, no Esther. So its important to write with the neediness that underlies the Esther syndrome in mind. By which I mean, avoid feeding it. As to the fiscal issues, intead of projecting based on vague stereotypes, why not ask TP members where they stand on most of them, practically speaking? Are they largely localists, who don’t want to pay money into the U.S. Treasury for domestic programs and homeland security but would rather decisions on spending be made locally and regionally, where voters can have greater input? Are they willing to forgo revenue sharing and federal assistance and instead to pay higher property and sales taxes in their counties and states to support infrastructure improvements, public safety (policing, firefighting) and education? Or, if they are willing to see standards in those areas change or decline in exchange for holding on to more of their own money, would they rather see some previously paved roads revert to gravel, parents largely undertake the financial responsibility of home schooling their children and paying out of pocket for their higher education? Instead of having the state support public schools at the K-12 levels and subsidize public universities? What about public safety? Should people who want lower taxes and fewer services pay subscriptions for fire fighting services, as in some rural areas now, and, as recently in Tennessee, live with the consequences, if failure to pay leads firefighters to let their house burn down? How do they define accountability and personal responsibility? And, of course, do they want an ability to opt out of Medicare, with those who prefer undertaking in full the obligations for coverage of their aging parents’ medical care, if the seniors cannot themselves afford to pay? That’s how things worked prior to 1965. The Internet provides opportunities to gather data for scholars to use if and when we want to go back and study what lay behind the thinking of various groups. Your essay makes some valid points about Ike but flubs others and generally is too shallow. Rarely do I see essays here that match up with the complexities and nuances found in real life convos among voters. Don't be fooled by Fox and echo chamber message boards. There's a lot more out there than that. And don’t throw an essay and then retreat. That just feeds the Esthers and validates the seeming neediness that lies behind the increasing use of victimology and grievance and its allied self praise. Look beyond the self-annoited, self praising Esthers, male and female alike. Not all Americans are as weak and needy as some of the FNC personalities suggest they are. Consider the possibility of diversity in political thinking, even among the Tea Party. Ask questions, probe, engage. Thank you. Genius is a little over the top, but I appreciate the thought. Our arguments at the beginning were mainly about the same as now, except we were both less tolerant and we've both developed a greater sense of the ridiculous. By the way, the VX residue found in 2004 in bunkers in western Iraq was indicative of enough chemical to kill a million people if broadcast by an explosion. Lucky? You bet. But it still ranks up there with the best of WMDs in the world. We dodged a horrible bullet, so to speak. It's really a shame, Bill, that we disagree on some basic principles, or perhaps, just on means of their realization. When almost everybody on the Left had been excited about Obama's presidency and everybody on the right had been truly upset, your loyal friend, has cautioned the left side about getting too euphoric and the right one - from getting too gloomy about that guy. I also cannot help friendly reminding you, Bill, about the ignominy you would express at my respective abilities at the dawn of our exchange. Again we agree on most everything except for the relative benefits of high taxes. But I must defend our Dear Exalted Leader from your attacks. He probably did not know about the evil deeds of those corporations from whom he accepted millions of dollars - GE, GMAC, Chase, Chrysler, and all those Wall Street firms who profited from the Great Leader's stimulus. Chicago politics have gone national. We agree on so much...makes me want to hug you. on the contrary (in an ideal case- scenario): it is based on them. Thus, the first quoted by Mr. Heuisler remark of D.Eisenhower is actually not in contention, but in unison with the remark made by same man, quoted by the article's author. to a will and respective interests of any government. not only remain silent, but loudly support the governmental abuses of power during the reign of practically all Republican administrations and Republican majority in Congress and Senate. actually "weak" in the spheres of defense and national security, regardless of the pertaining facts and events. However, the way they can afford to harmonize that bad "weakness" with the bad "strength" of the government has never been explained by any from their ranks. Surely, a country is only as strong militarily as is the unity of its majority with the government. the ideological core of Tea Party? have been broken and irreparably corrupted by corporate Goliath for many decades by now, but somehow ideologues on the Right have maintained virtually complete silence about that fact over Republican Presidents' and majority terms. However, since the moment Tea Party gained some popularity we are being deafened with insane "Down with taxes" screams, trying to impose a sense of guilt onto specifically those Americans who supported Democrats, in general, and President Obama, in particular. ...to add, the Whiskey Tax was repealed a few short years after the Rebellion. Does the good professor know that? All due respect, but this is a jumbled attempt at...what? Proving that the Tea Party is going to destroy America's dominance in the world? Dominant in what sense? That Washington would have despised a grass-roots and massive political force reacting to poor leadership? That Ike would have embraced our current disaster and suppressed the public in their attempt to correct matters based on their common sense and focused observations? Or perhaps this was an essay that tried to say too much, yet said nothing. I attended a 5 to 6 thousand member Tucson tea party yesterday and have participated in many others. The crowds are truly eclectic, average, informed and eager to participate in their country's future. These people are neither Nativist nor yahoos as some academics seem to believe. Your elitist contempt for the great unwashed hordes of the Tea Party is not only amusing, but based on your own rather naive ignorance of them... and of actual history. Contrary to your misguided sentiments, Eisenhower did not believe in big government, and he did believe in the importance of debate at every level. "To reduce complexity I believe it essential to keep governmental activities as close as possible to the people concerned. I have frequently stressed the need for these functions to be performed at local and state level rather than at the Federal." "Such unity is not only logical but indeed indispensable in a successful military organization, but in a democracy debate is the breath of life. This is to me what Lincoln meant by government "of the people, by the people, and for the people." The two references reveal the exact opposite sentiments about big government, citizen movements and free debate thst you ascribe to Eisenhower. Do some basic homework before you scorn the Tea Party as uninformed.